Kansas based JHS pedals have built a fiery reputation in recent years. With both overwhelming popularity and clout surrounding their ethics — cuing divided opinion amongst internet forums — there is little doubting their affluence across the globe. Their dirt boxes, especially the Angry Charlie, Morning Glory and SuperBolt have found their way to many pro-grade rigs. This review, however, is not a study of the company nor their respective success. Nor does it wish to provoke any debates surrounding such. It is rather a frank evaluation about what what the pedal does. And what the Twin Twelve does, is pretty bloody good. A refreshing box in a saturated* field that maintains their reputation for amp-like tones. Supposedly based — or rather, inspired — upon the 1484 Silvertone Amp, the Twin Twelve slots rather differently in the overdrive world. It is not a transparent boost, it is not a ‘screamer’ clone, nor is it particularly high-gain. It is rather an American-voiced ‘amp-like’ drive, with a gain structure somewhere between a Marshall breakup and something much fuzzier. Put simply, it does not one follow the usual suspects. The pedal itself sports an active EQ circuit, to tailor for your rig, and a separate gain and volume parameter. Which, unlike the original amp, allows for pushed tones at sensible volumes. It is for this reason the likes of Jack White, Beck amongst others are cited as original amp users — although I do wonder when Jonny Buckland ever cranked his to eleven. That said, the pedal has a variety of applications, some lesser known than others, and whilst it may be an acquired taste, such settings deserve greater attention. The most immediate quality to the Twin Twelve is its responsiveness. The first half of the demo keeps the dials relatively sensible; rolling off guitar volume to espouse different sounds. It is incredibly ‘tube-like’ and merely switching pickup can uncover drastically different tones. At its low gain settings, however, the Twin Twelve offers something rather useful. Being a bass-heavy effect — not muddy, but certainly not bright — it really adds much needed girth to single coils with the gain rolled back. The treble knob feels more like a presence control than anything shrill or ‘toppy’ — making it cut through the mix adequately. The EQ is more dramatically presented towards the end of the demo. [See: 3:50 onwards] Although this setting is temperamental with different pickups, my Telecaster Deluxe is much brighter than my other guitars, the moving ‘sweet-spot’ can be easily found. It also sounds fantastic stacked with a boost or into another pedal; filling out a lower-mid range in quite a unique fashion. It’s a dark, choppy breakup rather than, let’s say, a VOX chime, and works especially well with a British amplifier. On the opposite side of things, the Twin Twelve takes on a fuzzier dynamic when pushed. At its highest gain settings, it resembles more like a mid heavy Big Muff than a typical an JCM 800 or otherwise. It really nails that ‘Blue Album’ thickness without becoming fizzy. It’s certainly got an American voicing in there somewhere –– I believe Weezer used Mesa Boogies –– but it lacks the smooth scooped overtones those amps are famous for. It feels, as a result, like the awkward love child of a Marshall and a Mesa. A dream, no doubt, for some. Another point of conjecture regards its position in the single chain. Running after distortion makes it more of an amp simulator –– using a Tubescreamer to cook the front end like the real 1448. But placed before dirt, which is my personal preference, it becomes a powerful shaping tool, to add girth and drive to an otherwise cleanly signal. This entirely subjective, but demonstrates the wider applications for the pedal. As for its shortcomings? The overarching one is that this is an acquired taste. Although I insist it has multiple uses, albeit low-gain, high-gain or as a pre-amp, some will simply not click with its voicing. As a nineteens aficionado it satisfies those broody Soundgarden or Pumpkins rhythm tones, but the applications of such are more tenuous. It’s also far from a transparent drive –– which is why I like it –– but other will inevitable shy from. Do not except Klon-like qualities from this one. 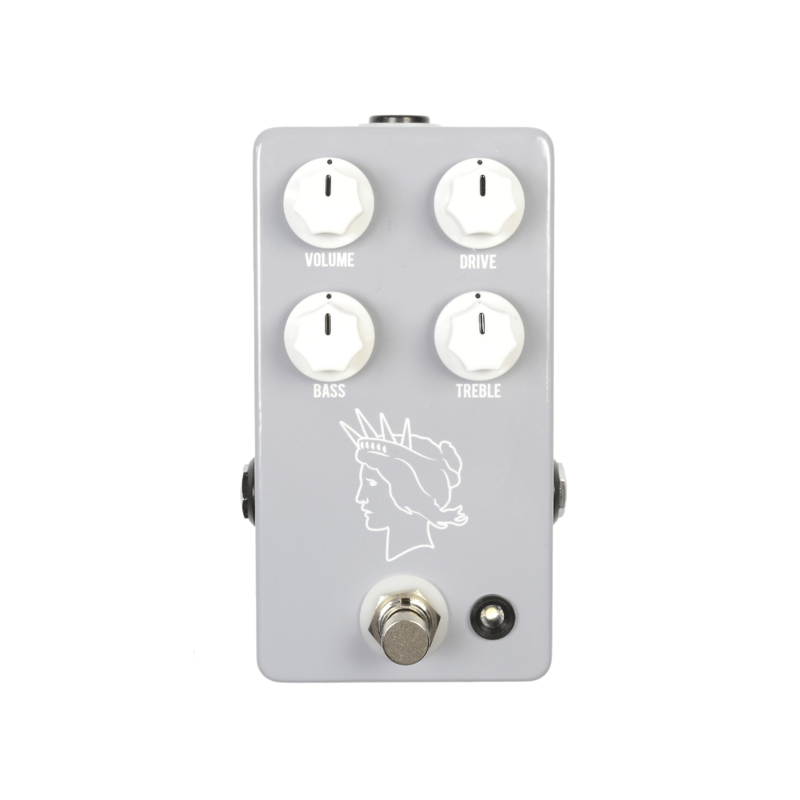 Overall, the Twin Twelve is a charming overdrive pedal with its own character. Whilst I am unsure how accurate a recreation of the amp it is –– the tones I gravitate towards are not feasible without a master volume –– it has an identity that earns its place on any board. It is thick, crunchy and with overtones of something a little lo-fi. And that’s precisely why I like it. It plays well with others and adds some eloquent EQ options. Just don’t expect transparency… or for it replace your Metal Zone. — It makes no qualms about imposing its own character; this is not a transparent drive! Hi great review! I’m quite attracted to its unique voice. How does it perform in midrange? Does it have loads? Will it cut through the mix? The Twin Twelve has an interesting mid-range. It’s quite thick and ‘barky’ – it’s certainly more pronounced than anything Fender voiced or scooped. But it’s not quite a classic Marshall, either. It essentially retains its dark, fat overtones with a usable presence. But, yes, in short, it does cut through the mix. I like it because it does so without the typically mid voice that others use. A little more lo-fi and fuzzy! It also stacks really well with other pedals. Which may help fine tune it to different amps.